Definition - What does Standing Crescent Pose mean? Standing crescent pose is a beginner standing posture that stretches the sides of the body. To practice this posture, begin in mountain pose with the big toes touching. Reach the arms overhead and interlace the fingers while pointing both index fingers. On an exhale, bend to one side, creating a crescent shape with the body. For a fuller expression of the pose, rotate the chest toward the sky and look upward. This pose is also known by its Sanskrit name, indudalasana. 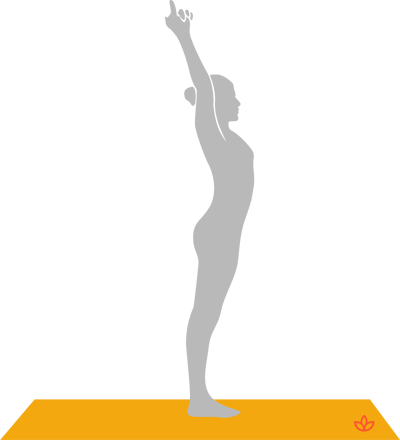 Standing crescent is a key posture in the Moon Salutation series. Unlike the Sun Salutation, which warms and energizes the body, Moon Salutation is a series of poses designed to calm and cool the body. Beginners or yogis with limited balance and/or flexibility can practice standing crescent pose with the feet farther apart. Alternate hand positions include overhead in prayer position or one arm extended overhead while the lower (in the direction of the bend) hand rests on the hip or on the thigh. Yogis with neck problems should keep the gaze forward rather than toward the sky.